It's easy to confuse groundhogs and gophers -- both are brown, fuzzy rodents that like to dig holes. Upon closer examination of these two rodents, however, marked differences in their appearances and habits become apparent. While their geographic ranges overlap, gophers and groundhogs differ in many aspects. The word "gopher" refers to 35 different rodent species divided into five genera. Gophers belong to the suborder Castorimorpha and family Geomyoidae, which contains pocket gophers, kangaroo rats, kangaroo mice and pocket mice. The typical gopher is the pocket gopher, a small fossorial creature. 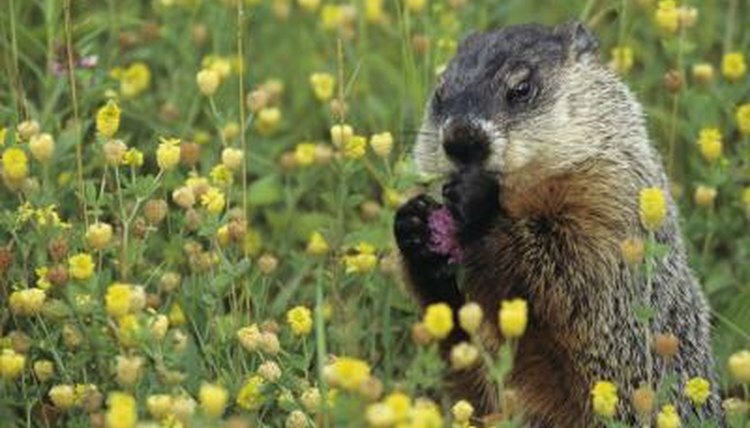 Groundhogs are considered part of the marmot group, which contains 14 species. Groundhogs belong to the order Sciuromorpha, family Sciuridae, which includes squirrels, chipmunks, marmots and prairie dogs. Groundhogs are the largest members of the squirrel family. The most common groundhog is the woodchuck (Marmota monax). Side by side, a gopher and a groundhog look quite different because the gopher's large incisors protrude from its mouth, even when closed, and the groundhog's teeth sit inside the mouth when closed. Woodchucks have white teeth, which is atypical among rodents. Gophers have yellow or brownish teeth. Many gophers have pink feet, while groundhogs tend to have dark brown or black feet. A gopher's tail is hairless where a groundhog's is short and covered in thick fur. The gopher's front feet are also more highly adapted for digging, with the claws curved away from the face to fling dirt over the shoulders during excavation. A gopher's front feet are shaped much like a squirrel's, good at holding small objects for nibbling. While gophers tend to max out at about 2 pounds for the largest species, groundhogs can weigh up to 13 pounds. Groundhogs are native to North America. The woodchuck is the most common and widespread groundhog, ranging from the southern United States up to Alaska and Labrador in Canada. Groundhogs spend much of their time on the surface, and they're often seen out and about in open and populated areas. However they sleep in dens, or simple tunnel systems dug into the earth. Groundhogs typically have separate dens for summer and winter. Various gopher species can be found in North and Central America. Gophers have complex burrow systems that are carefully constructed. Although gophers are solitary creatures, other animals frequently use their burrows. Certain gopher species, like the plains pocket gopher (Geomys bursarius), are rarely seen because they spend so much time in their burrows. Animals in the family Geomyidae are called pocket gophers, not because they can fit in your pocket, but because they have giant pockets in their cheeks that they use to store food. Gophers fill their cheek pouches with roots and tubers, their primary food source, and transport the food to their storage burrow. They have separate burrows for foraging, food stores, nesting and relieving themselves. Gophers seal off their burrows and fill their food stores, or "pantries," for winter hibernation. Rather than keeping a large food store, groundhogs gorge themselves through the summer, bulking up so they have an ample fat supply to feed them after nestling into their dens for winter sleep. Groundhogs eat roots as well, but they also dine on various other vegetation forms found above ground. How Do Armadillos Raise Their Young? What's the Difference Between Gophers & Prairie Dogs? Do Squirrels Have Cheek Pouches? Where Does a Chipmunk Sleep?